Small - $80.99 Medium - $80.99 Only 9 left! Large - $80.99 X-Large - $80.99 Only 7 left! When you go to town you float in on the last of your sinking ship, stepping from the top of the rigging to the dock as your ship bubbles to the bottom of the sea. That's how you roll, never acquiescing to the call of dry land until it's absolutely necessary. You've seen most of the seven seas, some of the corners of the world are more populated with monsters than the others. You escaped Davey Jones's hold, the jaws of the Kraken, and you've had crews try to maroon you but you've always managed to stay on the surface, treading water until the next opportunity sailed by. You were born for the pirate life, that easy going swagger comes naturally to you, or is it the rum? Either way, it's no wonder why you insist on being called captain even though you're without ship or crew at the moment. You're a high caliber cur, when you're in a tight spot it doesn't take long to find a way to sail into the golden horizon before they can land you with the dreaded black spot. 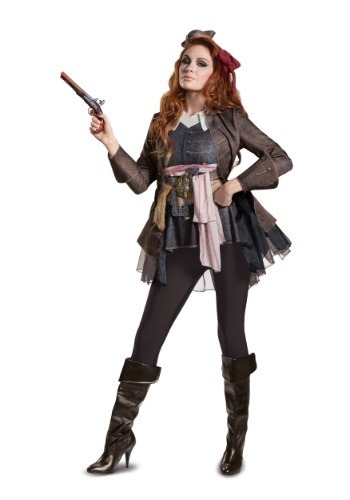 This women's Captain Jack Sparrow costume has all of the original Captain Jack nuances with a little more flair. The tunic has a detailed scrolling pattern and looks as if it was stolen from a fancy pants merchant off the coast of Barbados. An attached jacket fit over layers of belts, scarves, a strip of faux fur, and a tail of tulle. You think on your feet, you're ready for anything, and you've got plenty of flair. The only question left is, why's the rum always gone?